I have an early memory as a child of the priest coming to visit our house. 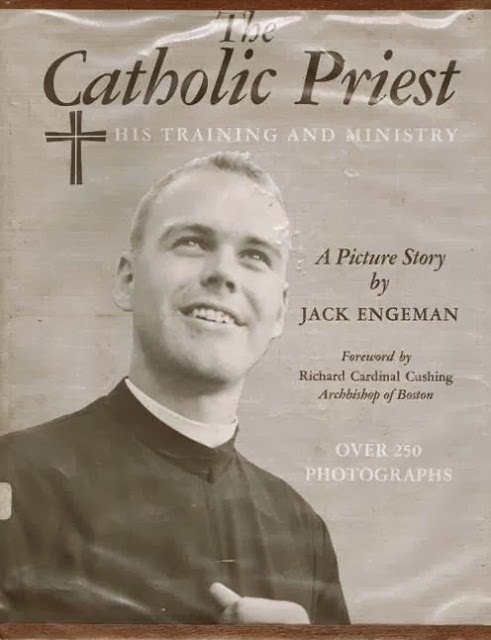 A young, handsome priest in a cassock, though it is possible he did not wear a cassock to visit us at all. At five or so, I was a little bit in love with this priest. I do not know what the reason for the house call was, but I remember being concerned. I knew my house was different, and I did not think different was good. I had listened carefully to the homily Father gave that past Sunday –that and the readings were the only things that happened in English, and as I said, I was a little bit in love. I remembered distinctly him telling us that everybody had their cross to bear. We, sad to say, did not. As close as I can remember to the crucifix in my grandparents’ home. It is actually a last rites set, which the owner of this set demonstrates here. My Slovak grandparents in Erie, Pennsylvania, where my mother grew up, clearly had a good Catholic home. There was a crucifix in the entryway, if you had any doubt. In the dining room, there was a picture of the Holy Family, a picture of Jesus with his heart on the outside, crowned in thorns, a picture of President John F. Kennedy, and a picture of Pope John XXIII. 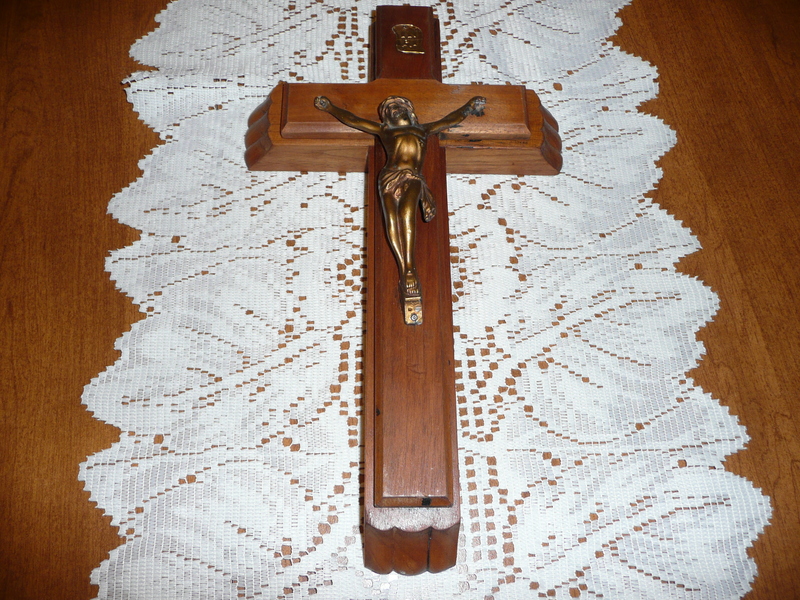 Over my grandparents’ bed there was another crucifix, making their large rounded headboard look rather like Calvary. Beneath that tortured Christ, five children were conceived. Draped over the bedposts on either side of Calvary were my grandparents’ rosary beads. Above their double dresser, tucked into the edges of the mirror’s frame, were holy cards with pictures of the martyred saints. At my other grandparents, on the farm where my father was born, the only cross was in my grandfather’s study, where he wrote his sermons. That cross was plain wood, nothing more. In the sitting room was my grandfather’s piano, where he would play “Rock of Ages” and “How Great Thou Art” and “Just a Closer Walk with Me” – hymns I never heard at St. Mary Our Mother’s. In my grandparents’ big farm kitchen you would find no President on the wall, and certainly no Pope. 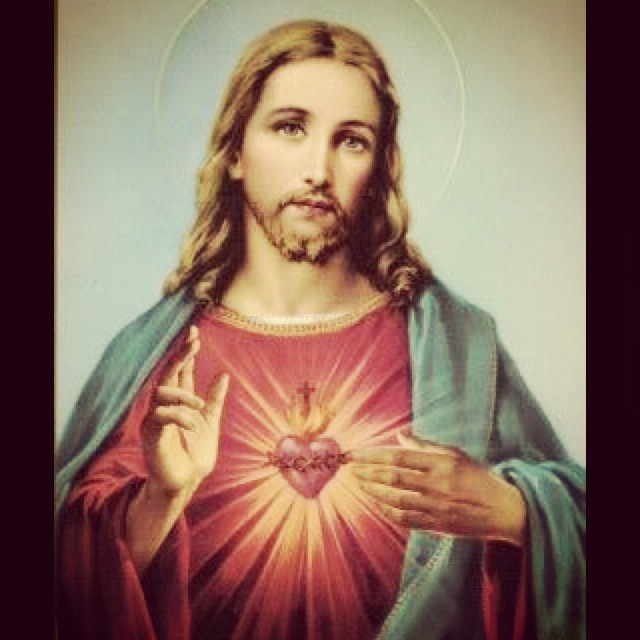 There were framed pictures of Jesus, but never could you see his heart. Instead he stared just a bit past you with brown and soulful eyes, or knocked at the door of your heart, while you kept him waiting, or he sweated it out in Gethsemane. But in my own home, the Protestant aesthetic and the Catholic aesthetic, like matter and anti-matter, seemed to have canceled each other out. My mother also seemed to think different was not good. The principles of good décor she absorbed from the pages of Good Housekeeping and Better Homes and Gardens did not allow for religious expression. I could hardly be expected to understand this at five; my entire focus was on the handsome young priest who was stepping down from the altar, where he belonged to God alone, to come to our house and pay special attention to us. To me. I said last week that I recognized myself in Mary McCarthy’s story. This is part of the reason why. In my eagerness to be worthy of that attention, I went into the garage, where the wood for the fireplace was piled against one wall. Yes, I know – it should have been outside. Maybe it was. But that’s not how I remember it. 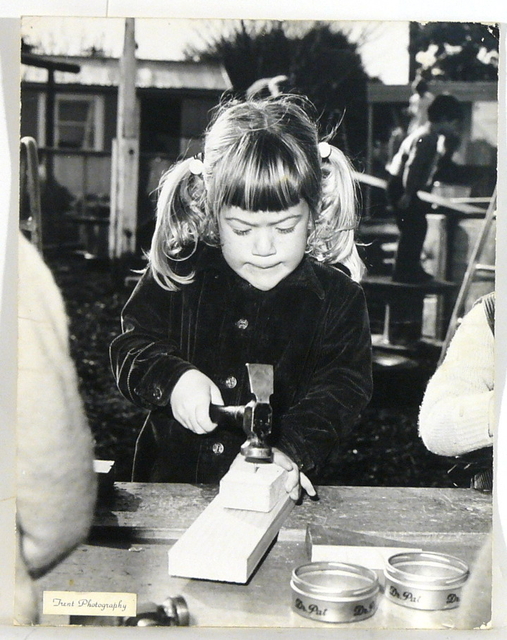 I found two pieces of kindling, took my father’s hammer from the peg board where the tools were stored, and a couple of nails from the glass baby jars on the table beneath the board, and got to work. It was hardly a proper crucifix, but it would have to do. Finding images to document my invisible past is sometimes hard. This one is from the National Museum in Australia. In contrast to this young lady, I did manage to get my two pieces of wood perpendicular. I do not remember what my mother did with the cross when I presented it to her. Nor do I remember the priest speaking to me at all. What I do remember – or seem to remember – was my mother and the priest laughing about my overly literal imagination, and my mother joking about my being her cross to bear. But perhaps that never happened. Perhaps this was just the effect I was after. Because I was precocious –precocious enough to know the difference between a literal and a metaphorical statement. That difference, however, was not about to get me noticed. In fact I was very much aware of how cute and endearing it would be to make the mistake that I did. The reason the event sticks in my memory is not because it proves what a religiously sensitive soul I was – though I really was worried that our house did not look like a Catholic house – but because this is the first time I can remember dumbing myself down for the sake of a laugh. Five years ago I might have been able to ask my mother if she remembered saying I was her cross to bear. I now really wish that I had. Because looking back, I realize that puns and double entendres never much figured into my mother’s style of humor. On the other hand, they have always been characteristic of my own. We were not exclusively Christian… a spiritually eclectic family… but Sallman’s picture hung on the wall. I had forgotten that… my mother loved the gentle strength in that face. 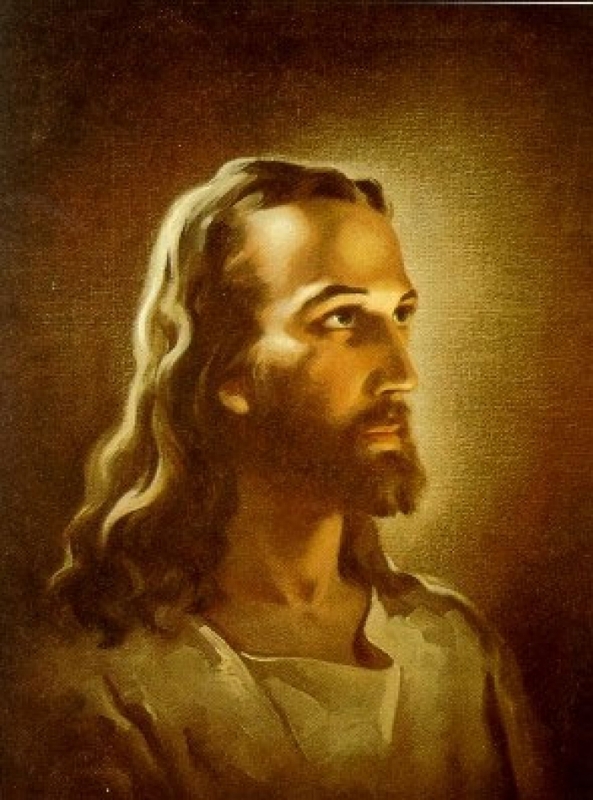 It doesn’t surprise me, it must be the archetypal image of Jesus for most people. Ah, from a cross to a bear. Wish I’d thought of that line when I was a kid. Well, I certainly knew a number of people who were un-bear-able when they were bearing crosses. I believe it is something of a double-edged sword, m’dear… but it’s my double-edged sword, for better or worse. I admire people who were so AWARE of themselves at such young ages. It took me forever to get much of a sense of myself. Thank you, Shannon. There are a lot of good words associated with vestments – cassock, chausible, surplice. I’m not familiar with Grantchester, but my daughter, who is seeking ordination herself (in the Episcopal Church) is a great fan of “Rev.” http://www.hulu.com/rev. This hit me: “this is the first time I can remember dumbing myself down for the sake of a laugh.” I have a precocious child. I hate that this term has developed a negative connotation. Is it just me? Thanks, Erin! That’s much appreciated. I was also a precocious child – much to my mothers chagrin. I understood her angst when my oldest son was born. WHERE was google when I needed it? I actually remember sleeping in a crib and can detail the layout of the room I shared with my sister. Now if I could only remember what I had for lunch. I guess having such early awareness gives us more experiences to draw from in our creative space. Great telling of a frozen moment for you.